Today’s(26.07.2018) Ishq Subhan Allah episode starts with Kabir and Zara come for sharia board meeting, Miraj comes for the meeting, qazi tells him to step out Ashe is not a member and when he is required, he will be called. Miraj goes out. Kabir nods at Miraj. Zara says to Kabir that I am thinking to resign from the board, he says are you joking? She says no, I am asking for your suggestion, he tells what do I say. Zara Tells Kabir that before the meeting starts she has to talk to him, Zara informs him that she had decided to quit the sharia board. Zara says Kabir I just want to remind you that you promised to protect my honor in front of people, these sharia board people made fun of me so I want you to say some nice words for me in there. Kabir says this was your plan, isn’t it? She says it was not my plan but you say what is right and wrong, so you decide, I will not force you. Shahbaz friend from sharia board give his resignation and recommends Miraj’s name. Kabir recalls Zara’s words to praise her. Kabir says I want to say something, Irfan allows him. He says I know that Miraj is being recommended and I have to say that though Miraj is not experienced and young guy, he should be elected as member of board as he is educated and is passionate about doing good for the community but my wife has recommended waiting for 30 days until his membership is confirmed, I generally don’t agree with Zara but Zara has been working for women, she has guts to take a stand, she has great thinking, she gave her life for this nation, she thinks ahead for future and I can’t deny that. Zara smiles at him. She says sharia board should consider her contribution to the board and after 30 days we should confirm his board membership. Khalid says Miraj lives in your house like a family, when you and Zara are suggesting his name then why 30 days? Kabir days rest of the members should also know Miraj like my family. Miraj is happy and on-call with Shahbaz, he says I am thinking to give a party and soon celebrate his membership in sharia board, he is called in the meeting, he is excited. Khalid asks him to come inside. Miraj comes inside and smirks. 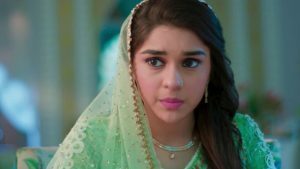 Qazi informs Miraj that he will be a member after 30 days, Khalid tells Miraj I suggested your name but Zara had other suggestions and Kabir took her side fully so go decided this. Miraj glares at Zara. Zara holds Kabir’s hands and leaves in front of Miraj. She recollects how Kabir had to leave Zara’s hands at inauguration, she smiles now he is holding her hand. Zara asks her father if her decision to resign is right or wrong, her mum says you should resign and take care of your home. Zara asks Kabir what she should do? Kabir says its good that you are asking me but I think you should take your decision, you will handle house if you resign but outside sharia board will lose a good member, her father tells her you to have 30 days to think until Miraj becomes a member and do not think you are my daughter or Kabir’s wife, think of yourself as Zara Siddiqui and decide. Zara Says I don’t understand your big words, what should I do? Irfan says you both ara intelligent, educated, you both should be part of this board. Zara says abba is saying right, Kabir smiles. Miraj is upset and Nilofar taunts that Zara has played her game well, Nilofar says you have lost badly. Miraj says Zara and Kabir did very wrong and they both will have to pay a price for it now. He gives her a diamond and says goodbye Imran (Kill Imran). He says kill Imran today itself. Kabir and Zara have coffee together and discuss what happened with Miraj at sharia board meeting, Zara says Miraj was unable to digest his failure today. Miraj lose son Kabir and tells him that you cannot handle the project, he should go and sit at his father in lose place and listen to his orders, Kabir says you are crossing all limits, Miraj says I am getting out of the project and I want all the money I gave back to you which you returned as Zara’s Maher Rakam at the time of your divorce. Later Zara sees Kabir tensed and asks him, he says I don’t have to tell you everything. Zara tells Reema something is very wrong, I need to find out.